Gas Insulated Switchgear Market size for 2016 was valued over USD 14 billion and is forecast to grow over 8% CAGR by 2024. Escalating demand for compact size substations on account of high land lease rates will drive the gas insulated switchgear market size. Installation for these products take 1/10th of the total space required for the conventional switchgears. In November 2015, the U.S. based Public Service Electric & Gas (PSEG) ordered compact and modular 420 kV GIS from ABB to enhance power reliability and protect network from extreme weather conditions. Growing investments toward replacement of aging electric grid network along with the increasing adoption of light weight electrical equipment will propel market growth. In May 2016, Ireland introduced refurbishment program with an aim to replace the ageing substation with a modern indoor GIS substation. Shifting trends toward adoption of sustainable energy coupled with stringent government norms to reduce carbon emissions will positively impact the industry. As per International Energy Agency, global spending on electricity generation in 2016 was USD 420 billion where renewables accounts for 70% of the total expenditure. Growing investments towards the development of High Voltage Direct Current (HVDC) systems will stimulate the gas insulated switchgear market. Effective interconnection support for AC circuits will further complement the industry outlook. In November 2016, GE in collaboration with Clean Line Energy announced the development of the U.S. largest clean energy HVDC line project. <38 kV gas insulated switchgear market is set to expand over 8% on account of its wide acceptance across power, infrastructure and process industries. In August 2016, GIL Automations supplied 33kV GIS for operations at the facility of an International Oil Company operating in Nigeria which includes design and fabrication of the 33kV switchgear. Growing demand for efficient and low-cost switchgear across coal and natural gas fired power stations will stimulate the >150kV gas insulated switchgear market. In April 2017, Toshiba Corporation announced to deliver 500kV GIS to Tanjung Jati B Power Plant unit expansion project in Indonesia. High voltage in 2016, accounted for over 60% of the market revenue share. The product possesses extensive applications in integration of renewable power generation unit to the grid, railways and power transmission. In June 2016, ABB announced to deliver high voltage GIS to new Sebenza intake substation in South Africa. Ease of availability along with simple and safe installation are some of the key features which will fuel the medium voltage gas insulated switchgear market growth. In July 2015, Government of UAE selected ABB for the supply medium voltage products including 33 kV GIS for its remote oilfield projects. Infrastructure and transport applications is predicted to expand over 8% by 2024. Excellent insulating property coupled with high reliability index are some of the key parameters which will drive the global industry growth. As per the European Energy Performance of Buildings Directive, all new constructed buildings need to be nearly zero-energy by 2020. In July 2015, the European Commission proclaimed investment of USD 78.95 million in nearly zero-energy buildings under the Affirmative Integrated Energy Design Action (AIDA) project. High arc-quenching property along with significant dielectric strength of SF6 will foster the market across transmission & distribution applications. In January 2017, Siemens announced to supply GIS to high-voltage substation of State Power Utility in Indonesia for supporting transmission solutions. Outdoor gas insulated switchgear market size in 2016, was valued over USD 11 billion. Flexibility to operate in harsh climatic conditions along with easy planning of outages for service and maintenance will make its adoption favorable. Indoor gas insulated switchgear market will witness strong growth owing to growing demand for safe and efficient electrical equipment for confined space. Flourishing real state sector due to rising private investments will further stimulate the business outlook. In April 2015, ABB delivered indoor GIS to thirteen 66/11 kV substations to support infrastructure development projects in Qatar. The U.S. in 2016, accounted for over 65% of the North America gas insulated switchgear market share. Government initiatives toward upgradation and replacement of aging electrical network will stimulate the business growth. In 2017, the U.S. Federal Transit Administration announced to invest USD 647 million in the Peninsula Corridor Electrification Project from San Francisco to Tamien. Upgradation of manufacturing facilities under the “Made in China 2025 Plan” will stimulate China market. Positive outlook towards renewable energy sector will further complement the industry landscape. In 2016, Government of China announced to invest USD 87.37 billion towards the development of new Ultra High Voltage (UHV) lines in next five years for efficiently transfer surplus electricity across remote areas. 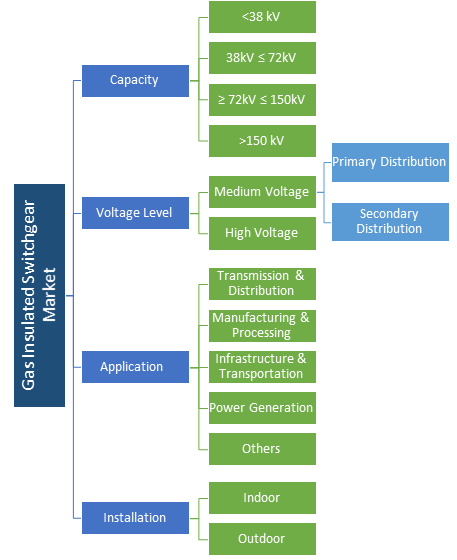 Favorable government measures towards renewable energy integration coupled with adoption of decentralized energy systems will augment Germany gas insulated switchgear market size. In November 2016, Germany announced to double renewable power by 2030 with an aim to cut greenhouse gas emission by 95% by 2050 compared to 1990 levels. Key participants in the industry include ABB, Toshiba, Siemens AG, Schneider Electric, General Electric, Mitsubishi Electric, Larsen and Toubro, CG Power and Industrial Solutions, Hyundai Heavy Industries, Hitachi, Ormazabal, Fuji Electric, Nissin electric, Chint Group, Xi'an XD Switchgear Electric, Hyosung, Meidensha Corporation, and Alstom. Industry players are focusing more towards inorganic expansions which includes joint ventures and merger & acquisition to enhance their business presence. In April 2015, Hitachi entered into joint venture with Walid Ahmad Juffali Company to manufacturing unit in Jeddah, Saudi Arabia. These products are metal encapsulated compact switchgear consisting of circuit-breakers and disconnector which is used to control, isolate and protect electrical equipment. It is suitable for congested areas including extensions, on roofs, in city buildings, on offshore platforms, hydro power plants and industrial plants. GIS commonly uses sulfur hexafluoride or mixture of SF6 and N2. ABB has introduced fluoroketone-based SF6 mixture of gas as an alternative to SF6 to avoid environmental impact.